Being a parent is tough right? I don’t know about you, but being a sleep deprived working mama of 2 active girls is several full time jobs in and of itself, and as much as I love the conveniences that modern technology brings, I often find myself on information overload. There are so many articles, studies and blogs on what you should a NEVER feed your child, of the activities they should ALWAYS do – strict guidelines, rigid rules, extreme boundaries, absolute hardlines (often conflicting) – it’s enough to make his mama want to give up before I even start! This is why I love the Healthy Family Expo, and am so excited to be an ambassador for them! They all about small steps and simple solutions to healthy, active and eco-friendly living for busy families. They get that many parents are overwhelmed by all the expert opinions that abound and need easy, actionable items, tools and encouragement (not shame and negativity) to make small, consistent changes toward a better life for ourselves and our families. The Expo seems like a long way off (March 2015), but the fun is starting now! 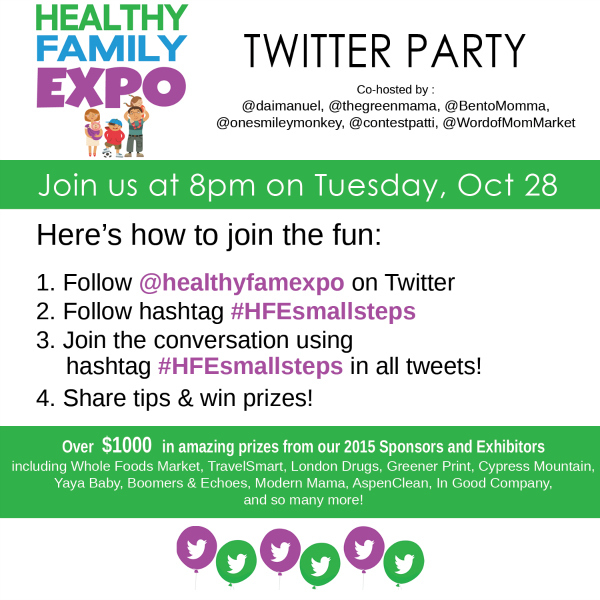 The Healthy Family Expo is hosting a Twitter Party on Tuesday, October 28 at 8pm PST to introduce some of their amazing sponsors and exhibitors to all of you – and give away over $1000 in prizes from Whole Foods Market, TravelSmart, London Drugs, Greener Print Solutions Inc., Cypress Mountain, AspenClean, Yaya Baby, In Good Company, Boomers & Echoes Kids & Maternity, Modern Mama, Love Child Organics, Pedalheads, Kristen Yarker, Child-Feeding Expert, ENJO (Kate Bailey), Naked Coconuts, SPUD, BC Playthings, Hydralyte, Norwex (Garcie Wong), GnuSanté, Bearfoot Playground and so many more! Want in? It’s open to all of Canada, all you have to do is follow @HealthyFamExpo on Twitter, and use the hashtag #HFEsmallsteps to join the fun! Before you get the party started, be sure to follow our wonderful sponsors and co-hosts too (find them all here) and RSVP with the linky below in order to be eligible to win! Use your Twitter handle for ‘Your Name’ and any web address (website, blog, facebook profile etc) for the ‘URL’ as long as it starts with ‘http://’. This should be a fun twitter party! I am a big believer in self-care for Moms! We all deserve, need, want to have quality sanity time. And that just makes us a BETTER mom. Thanks! I hope you can still make the new date on Oct 28 at 8pm!